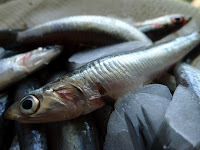 Little fish with big flavor--fresh anchovies--boquerones. Anchovies? Those salty little fish packed in cans? An ingredient in salads or pizza topping. Hang on, these are different--fresh ones are something else all together. Fresh anchovies, which measure about 5 to 5 ½ inches long, are abundant on the Mediterranean and Bay of Biscay coasts of Spain. The anchovy is a silvery fish with a protruding upper jaw, from whence it gets its Spanish name, boquerón, “big mouth.” (Though, with those great big eyes, maybe it could be called ojón, as well.) In northern Spain, the same fish is called anchoa. 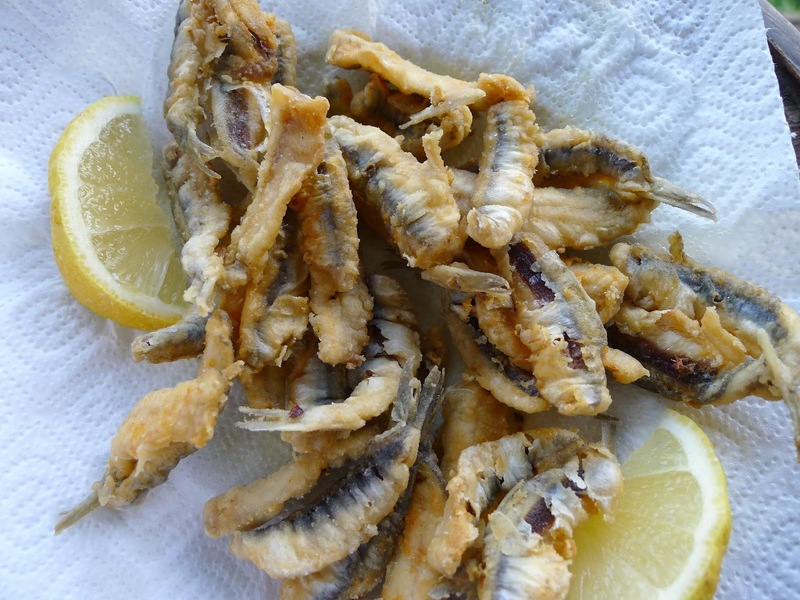 A heap of fried boquerones. I love fresh anchovies, simply floured and fried. They always come as part of a mixed fish fry so popular on the Costa del Sol where I live. They can also be boned and dipped in a fritter batter before frying. Basque cooks sizzle anchovies in oil with garlic and flecks of chile or combine them with eggs to make an omelette. And then there’s that favorite tapa bar dish—boquerones en vinagre, fresh anchovies marinated in vinegar. The vinegar cooks the fish—no heat required—somewhat like ceviche. The anchovies are then dressed with olive oil, chopped garlic and parsley. My local fish market usually has two sorts of fresh anchovies. They appear pretty much the same in size and color—but one is considerably more expensive (I paid €8.20 per kilo, or about $4.65 per pound). Juan, the fish guy, said they come from Cádiz—Atlantic port—and are firmer and whiter. The others come from Castellón (Valencia coast, on the Mediterranean). Though absolutely fresh, these looked limp. Juan said the Atlantic ones were best for marinating in vinegar, but the Mediterranean ones were great for frying. I planned to marinate them, so I bought the pricier ones. The little fish first have to be filleted—surprisingly easy, so have a go. 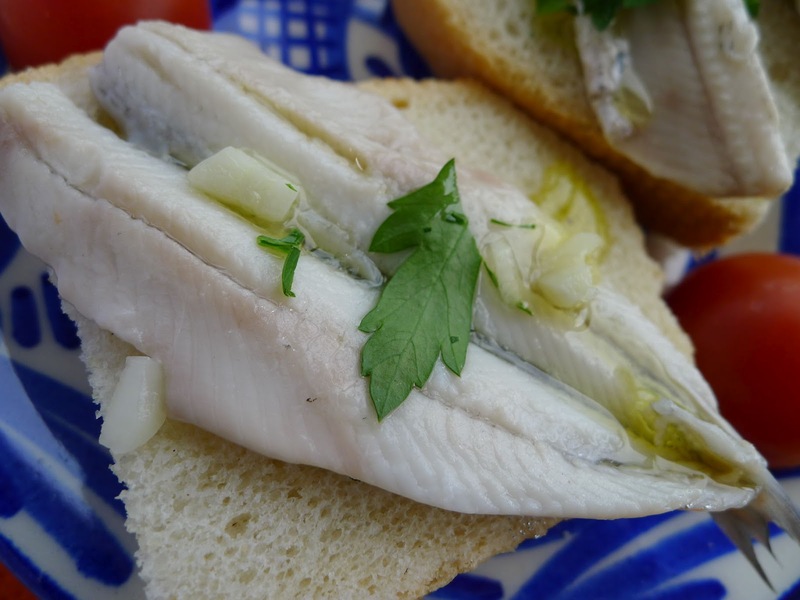 Serve the anchovies accompanied by bread. Some tapa connoisseurs like to heap the little fish on the bread. Others prefer to eat the anchovies straight up, with a cocktail pick or small fork, then dip the bread in the tangy dressing left on the plate. 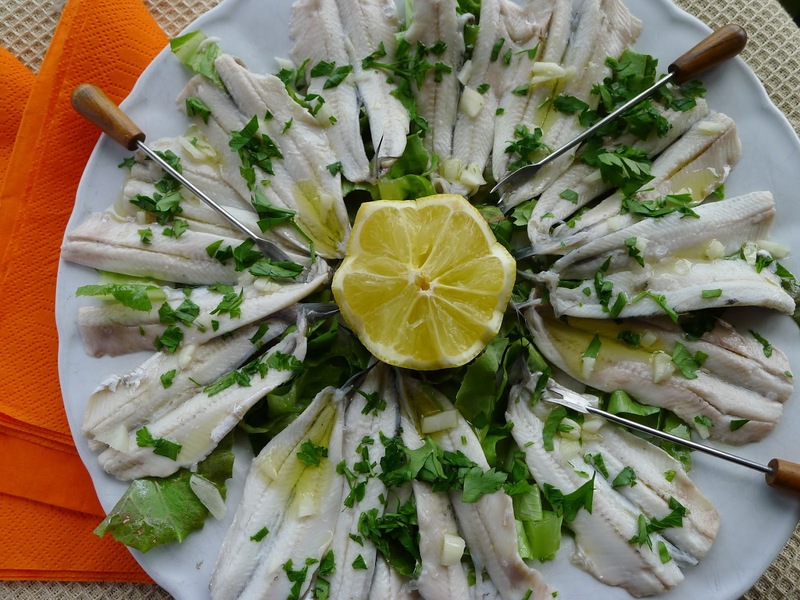 Marinated anchovies with garlic and parsley--a favorite tapa. 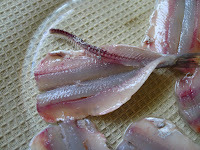 To fillet the anchovies: cut off the head and pull out the innards of the fish. Grasp the top of the spine and pull it down across the belly of the fish, then cut off the spine, leaving the fillets attached at the tail. Rinse the fillets in water, then place them in ice water for 30 minutes to firm them. 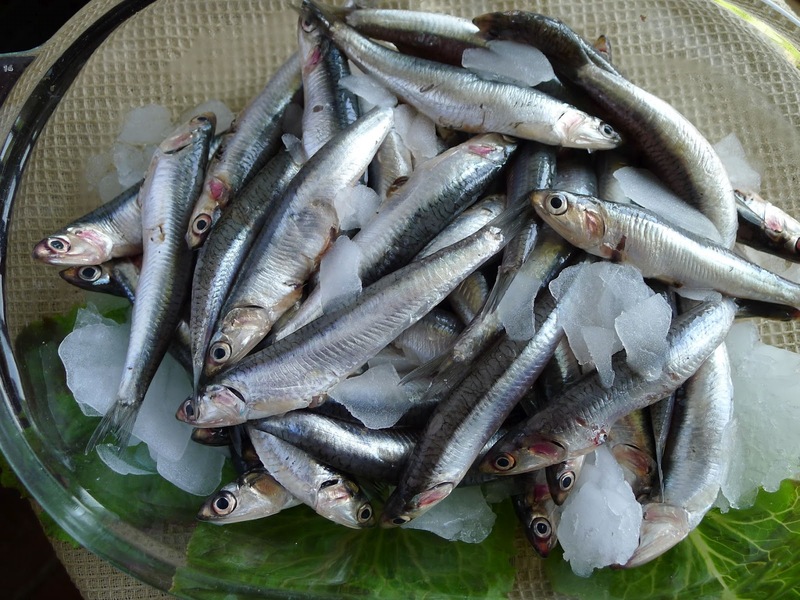 Place the anchovies, skin-side down, in a single layer in a non-reactive container (glass, ceramic or plastic). Pour over the vinegar—enough to cover the fish—and the salt. Cover and refrigerate at least 6 hours or up to 24 hours. The fillets will turn white and opaque. Before serving, drain off all the vinegar marinade and rinse the anchovies in cold water. Drain well and pat dry. Arrange them skin-side down, like spokes of a wheel, on a serving dish. Sprinkle with oil, garlic and parsley. Garnish the dish with lettuce, a cut-lemon in the center, and a little chopped green onion. Serve with bread. Very delicious, and sustainable, too! SALMOREJO--IS IT A DIP? A SAUCE? GAZPACHO?